d-Amino acid-containing peptides (DAACPs) in animals are a class of bioactive molecules formed via the posttranslational modification of peptides consisting of all-l-amino acid residues. Amino acid residue isomerization greatly impacts the function of the resulting DAACP. 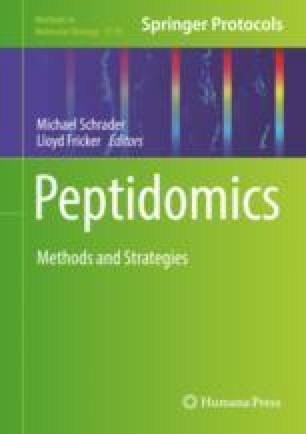 However, because isomerization does not change the peptide’s mass, this modification is difficult to detect by most mass spectrometry-based peptidomic approaches. Here we describe a method for the identification of DAACPs that can be used to systematically survey peptides extracted from a tissue sample in a non-targeted manner. This work was supported by the National Institutes of Health, Award No. P30 DA018310 from the National Institute on Drug Abuse (NIDA) and Award No. 2 R01NS031609 from the National Institute of Neurological Disorders and Stroke (NINDS). J.W.C. was supported in part by a Beckman Institute Postdoctoral Fellowship, funded by a Beckman Foundation gift to the Beckman Institute for Advanced Science and Technology at the University of Illinois at Urbana-Champaign. The content is solely the responsibility of the authors and does not necessarily represent the official views of the funding agencies.